Try heels with your cuffed jeans. It's a look that harkens back to the 1980s, but its recent resurgence has led many to mull over what shoes to wear with cuffed jeans. Though this denim style isn't for everyone - it has its fair share of lovers and haters alike - those who do enjoy it are often left wondering how best to style their overall look. Shoes play an important role in the complete picture. Denim trends know no bounds: There's been a time and place for everything, including cropped, flared, skinny and baggy. Each style has enjoyed immense popularity, both in the mainstream and amongst celebrities. In fact, it's usually the latter that explains the growth of a particular trend. 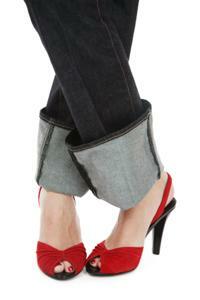 One of the more recent trends to invade the denim world is the cuffed jean, also known as the boyfriend jean. To call it "recent" is a bit of a misstatement, since cuffed jeans were once all the rage. Back in the late '80s, men and women folded the cuffs of their jeans tightly around the ankles, often extending them a bit higher than their sneakers. The sheer retro appeal of the fad might be to blame for its resurgence in 2008, but the love affair was truly rekindled after actress Katie Holmes was spotted wearing the jeans out and about. Pretty soon, actresses everywhere were sporting the uber-casual style. Though the present-day jeans closely resemble those worn in the '80s - with a few updated tweaks and a couple of big name designers adding major leverage, of course - the difference is in the way the entire ensemble is styled. Back then, it was all about going over-the-top and being excessive. T-shirts were baggy, jeans were baggy and the shoes of choice were usually the aforementioned sneakers. Others would opt for high-tops or a classic pair of white Keds. Today, women wear tops that balance the cuffed jean, perhaps adding an accessory or two to create a look that flows well. And on their feet? The answer is simple: Anything goes. The question you should probably ask yourself as you ponder the footwear choices is whether you prefer to go ladylike or sporty for the day. Believe it or not, cuffed jeans do boast a slightly pulled together feel, particularly if they're less on the baggy side and more of the straight leg, skinny variety. Contrarily, they can also be quite sporty and youthful when they're more relaxed and loose. Depending on which style you wear, you can allow that to dictate the types of shoes you might choose. Skinny, cuffed jeans look perfect when they're folded right at the ankle and worn with a pair of flats. Try a slightly loose fitting white blouse tucked into the jeans and consider the shoes a focal point of your ensemble. Anything from solid flats in a bold hue to vividly patterned flats will work beautifully (floral prints are great during the spring and summer). Try loose fitting cuffed jeans with a pair of bold, edgy gladiator heels. There's a strong disparity between the two pieces - one is easygoing and laidback, the other fashion forward and chic - and that creates instant visual intrigue. Heels of almost any kind pair perfectly with almost all styles of cuffed jeans. If you're not fond of flats and refuse to leave the house without at least an extra two or three inches on you, then by all means stick with those heels! Open-toe styles are always classic. During the cooler months, opt for a pair of sharp booties. Some stylists suggest that tucking the cuffed jean into a pair of long boots is also an option. If you're a fan of those jeans, though, don't hide them! When in doubt about what shoes to wear with cuffed jeans, take your cue from celebrities. Flip through the pages of any magazine and you're likely to find a shot or two of someone clad in a pair of the famous boyfriend jeans!